It’s sad when your tween has the same diet as your baby! Blog reader, Heather, emailed me desperate for ideas beyond yogurt and applesauce. Her poor child WAS a great eater, but now that she can’t eat nuts, granola, popcorn, crusty bread, and “pretty much anything that crunches”, she’s been struggling to know what to eat. Foods high in acidity that could cause discoloration like lemons, limes and sodas. This was a hard menu for me! Any other ideas of soft foods that would be ideal for these kids? I bought my daughter the carrots that are cut like chips. They are still hard but she can eat them with braces without damaging her brackets. She can also eat apples if she slices them up. Braces can definitely be frustrating! She especially misses popcorn. Thanks Rachel! I’m sure we’ll be cutting up many things. 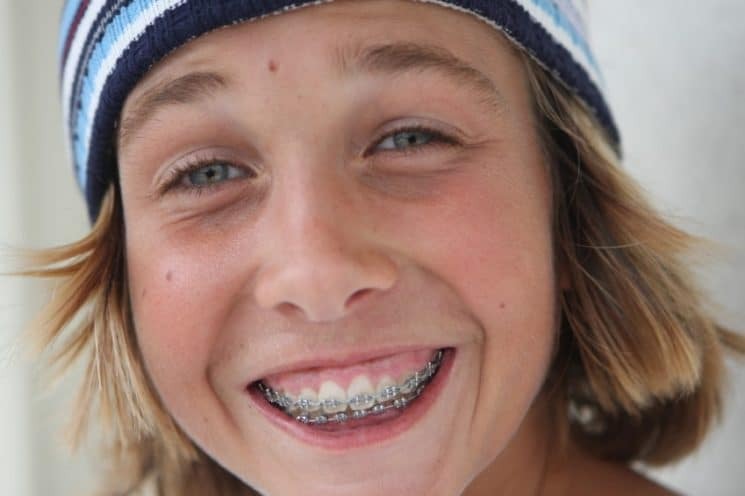 Take heart, TK had braces for about 9 months when he was about 9. It was not nearly as bad as I anticipated… we mostly just cut more (apples, corn on the cob, etc). We don’t really allow gum anyway but he did miss popcorn. This is a fantastic idea, but my daughter is a vegetarian. Do you have other meal plans that don’t include meats? Funny thing Kim, I was trying so hard to find more protein foods when I was making this. I’ll see if I can come up with some more vegetarian alternatives. I have worked as an Orthodontic Assistant since 2002 and thought I would share some info with you… 🙂 The soreness will abate within a week and your child will go right back to eating normal foods. After that first period of soreness they may have a day here or there where they are sore, but never again like the 1st week of braces. Great ways to get them through it are with Smoothies and Hot tea/chocolate. The warm and cold help loosen up those ligaments and many times Orthodontists use Heat Activated wires, so sipping something cold helps with the rigidity of the wire as well. You can also try giving them some Advil 20 minutes before meals to make eating less painful and have them chew sugar free gum as it doesn’t stick but also the chewing motion loosens up the ligaments around the teeth. Thanks for sharing Brooke! It is good to know it won’t last forever! Thanks Michelle. I remember always cutting my corn off the cob! I was so sad not to eat it altogether! 🙂 I got over it though. Rachel- I don’t blame her. I love popcorn! Not that I’m the best expert, but I have two 10-yr-olds in braces since July of last year. They regularly eat taco shells, pizza crust, crackers, and pretzels. They can eat apples as long as they are sliced, same with pears. I guess we’re lucky because they have the braces that are self-adjusting and they never have “tightening” so there’s been very little pain. We absolutely stay away from gum, caramels, sticky stuff, etc., but the “hard” healthy foods we thought were out haven’t been a problem at all. I’m going to get braces sometime this year and some of my friends have them and I absolutely DON’T WANT TO GET BRACES!!!!!!! Can you help me change my mind? I might be getting braces this year and I have no idea what to eat and what. it to eat but this really helped me find out is there anything for me to eat that is something that I can now?? My daughter got braces about a month ago – wish I had this plan then! We’re adjusting well – still getting used to all the dietary changes. (That girl LOVES her crunchy snacks!) She has done lots of smoothies – the coldness helps alot. For a trip to the movies with friends, I bought her individually packaged Pirates Booty, and she didn’t miss the popcorn. We’ve also done some baked casseroles – butternut squash mac & cheese has been a real comfort food for her – also a yummy turkey shepherd’s pie. I am 29 years old and got braces about a month ago. Due to a deep bite and turbo brackets on my front two teeth, I can not touch any of my teeth anywhere in my mouth. Nobody has really mentioned this online. I am not in pain but am unable to chew because my teeth don’t touch…literally. I am running out of meal ideas and seem to be eating mashed potatoes and meatloaf way too often. I don’t weigh much as it is, so getting a little worried. Any other ideas? So sorry to hear about that! Here is a link for more soft food ideas: http://www.dietriffic.com/2010/03/16/soft-food-diet/. Good luck! they wont poke you in the back, they cut the wire in the back. if they dont, ask them to. after getting them eat anything you want , right away and fill up on food, you wont be eating anything substantial for weeks. Carrots and other raw vegtables dont hurt for the first hour so stock up. And as for the brackets rubbing your lips, except for on the bottom, mine dont bother me, so you should be fine. Your actual teeth will hurt, not the rest of your mouth so- mashed potato mania! My family couldn’t afford to get braces (we were a family of 9 years ago), and now because my teeth are crooked it is easier for food to decay and has caused lots of cavities, with even losing a couple of teeth because of it. I brush and floss constantly but it seems to be a uphill battle. The pain of braces can’t compare to the pain of scraping the teeth or the root canal, or having a tooth pulled. I was determined that my son was going to have braces so he doesn’t have the same problems as I do. Wish I’d seen this blog-stream when it started! I’d love to point people to my books, website, blog and FB pages that address “taking the bite out of braces!” After getting my three teens through braces, plus having my own second-round, adult braces, I’ve gathered many comfort, care and cooking ideas. Please see http://www.MetalMouthMedia.net so we can all share what works. Regarding the need for really soft (no-chew) foods, pureed sweet potatoes and cream of wheat with protein powder mixed in are two possibilities. If you can manage meatloaf, then I think scrambled eggs with melted cheese and protein powder or tofu mixed in would also work. Best wishes everyone – it’s so worth it. Thanks! This helped me out a lot… I got my bottom braces on Thursday and my teeth have been killing me ever since… Besides the fact that my braces gave me a huge ulcer on my gum but oh well… Finally i’m excited to try some of this stuff so that way i can finally eat something! Thanks! Did Erica finish with braces? How did it all work out? Would love for you and she to review my Braces Cookbook – let me know if I could send you a review copy. Would love to know how you’re doing, now that your braces have been on for a month. Any favorite recipes yet? This blog is great:) anyways.. I got my braces put on this Monday… And I have a retainer and it prevents me from hitting my lower brackes, and I have a lisp when I wear it and I can’t touch any of my teeth together with this retainer in (did I mention that I never get to take it out, only to clean it…) and I can’t even chew something uber soft… Ideas??!! For anyone reading in 2017 puff corn is a at alternative to popcorn. I remember how difficult it was to eat when I was on my orthodontic treatment. fortunately I have got rid of the braces and now I can eat whatever I want to eat. I just got my braces 2 weeks ago and I had to have my bite opened up so I won’t bite my brackets off. This makes eating very difficult because I can’t bite down with my front teeth. I have eaten a lot of yogurt and super soft stuff. I have to tear or cut everything into small pieces. I have figured out that I can eat steamed veggies but the have to be really soft. You have shared a healthy meal plan for all of those who are wearing braces or wiling to wear braces. Great resource. The printable meal plans link goes to “404 Not Found.” Hope you can fix it!